How Does the Queen Bee Control the Hive? Have you been on a playground lately and heard the chant, “Girls rule, boys drool!” Fun fact: when it comes to bees, that is almost literally true. The queen bee is the supreme ruler of the hive, and her ascent to the honeycomb throne is fraught with intrigue and perhaps even a fight to the death. It all starts when an existing queen lays her eggs: fertilized ones become either female workers or another queen, while unfertilized ones become male drones. (More on them later.) 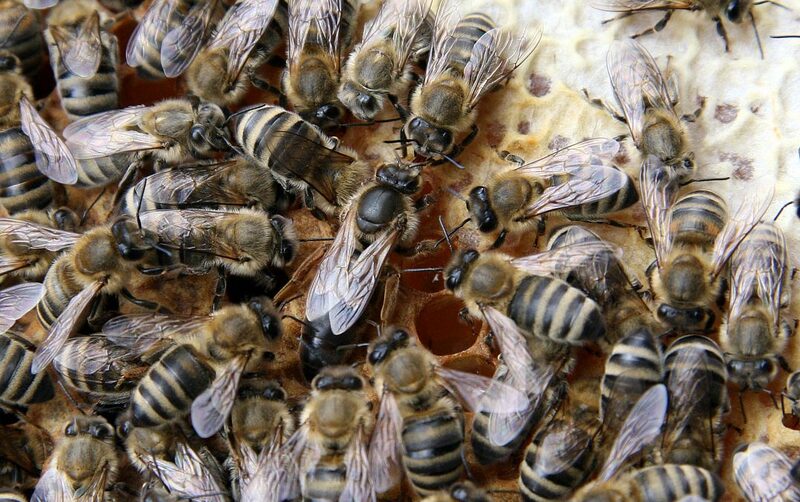 When the queen is weak, or the hive is planning on swarming, the worker bees create queen cells: they put eggs in those special cells and the eggs are fed a nutritious royal jelly. Here comes the drool: that delicious, nutritious food comes from the sinus cavities of the worker bees. YUM. This royal jelly allows the queen to develop to full reproductive maturity, and her ascent to queen takes a grand total of 16 days from being laid to emerging to rule and reign. Hell Hath No Fury Like the Queen Bee! Should she find another queen-hopeful that has already emerged, they will sting each other repeatedly until only one of them survives. Unlike worker bees who die after stinging just one time, queens use their stingers over…and over…and over again. You might think that if a beehive had more than one queen that the work would progress at a quicker pace. But two queens will almost never work under the same roof. I have only once in the 36 years of my experience in beekeeping seen two queens working in one hive. Very infrequently, a mother (queen) will allow one of her daughters (queen) to hatch and work alongside of her, but this is a rarity. Once the ascendant queen has eliminated all potential rivals, she takes the next week to gather her followers to the hive: by producing a pheromone called “queen substance” which the workers pass from one bee to another, the colony realizes that they have a functioning queen. The hive calms down; you can even tell the difference between a hive with a queen and one without by the activity level of the bees inside and the pitch of their buzzing. After her week of “Hive-flix and chill” and taking a few test flights to orient herself to the location of her hive, love is in the air as the queen starts taking nuptial flights in order to mate with 25-40 drone bees – in midair, no less – over the next 10 days. She chooses a variety of drones for her romantic interludes; her choices include both calm and aggressive drones, some who are good at producing honey and others who are good at making wax. Ever heard someone say that men are only good for one thing? Well, when it comes to drones, that couldn’t be more accurate: their sole purpose is to mate with the queen – and when they do, they die as the queen flies away with their…er, jewels. When the queen finishes her nuptial flights, she will settle down to her job of laying eggs. As it warms up in the spring and more food comes into the hive, the queen will start laying more eggs, maxing out at 2000 eggs per day. As the honey flows, when a certain flower blooms that bees gather nectar from, such as orange blossom, the queen will have created a hive with as many workers as she possibly can produce so that the hive will have stores of pollen and honey for the future. And, as the queen nears the end of her reign—remember, she started her journey as an egg very much like the ones she is now laying—her worker bees tend to her every need, from feeding to cleaning and grooming.